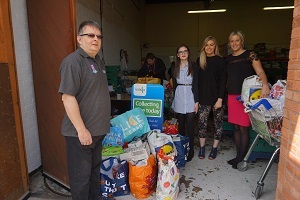 Team XL have donated a staggering 524kg of food to the Peterborough Food Bank. Every quarter, the team here at XL Displays partake in a food collection to give to our local food bank in Peterborough. This quarter we donated the largest amount of food we have ever collected, weighing in at an impressive 524kg. That’s a total of 1,429 items, which is enough to feed 64 families in Peterborough for a whole week! It took two cars and three people to deliver the donation. When we pulled up to the food bank, the volunteers were over the moon with the amount of food items we had collected on their behalf. We actively take part in many fundraising activities for various charities throughout the year. This time, for the foodbank collection we decided to turn up the heat a little and create a battle of the departments internal competition. We’re a competitive bunch, so we separated each department into different teams and all battled it out to see who could raise the highest volume of food items in order to win. The Feliciettes, aka the admin team, collected an astonishing 353 items between them and snatched the top spot. Our competitiveness not only brought the team together, but it also enabled us to help the Peterborough Food Bank entirely restock two of their branches and help so many people in crisis. The Peterborough Food Bank opened its doors in 2012 with three branches. It now has nine branches, highlighting the extent of people living in hunger in the UK. It was founded by local churches and community groups in order to tackle the issue of hunger within the city. There are only two paid members of staff; everyone else gives up their own time to volunteer and help out where they can. XL Displays are proud to support such a worthy cause because we firmly believe that it is of utmost importance to show people who are in a vulnerable situation that there are people out there who do care and who do want to help. Additionally, you never know when you might find yourself in need of the services of the food bank. Next quarter we aim to donate even more items and help more people than ever with small gestures of kindness and compassion. We encourage other local businesses and anyone who is in a position to give food items to do so as every tin or jar of sauce helps someone in need. We are delighted to be taking part in this years Peterborough Dragon Boat Festival which is taking place at the Peterborough Rowing Lake on Saturday 9th June. We have taken this challenge on for three reasons. The first and most important reason is to raise as much money as we possibly can in support of our chosen charity, Sue Ryder Thorpe Hall Hospice. Secondly, we find these fundraising days invaluable for team building and boosting engagement, and thirdly, we love getting involved with our local community. Giving something back to our local community is extremely humbling and rewarding. With many of our team members having personal connections to Sue Ryder Hospice, we find supporting such an amazing and local charity which our team can relate to enables us to be extremely successful in our fundraising efforts. Our team really gets behind each activity we undertake and always strives to raise the most they can. At XL Displays we create, design and build pop up displays, roller banners and exhibition stands that get you results. We are award winning specialists in providing cost-effective display solutions for exhibitions and events. For more information about any of our products, please Contact Us or call our sales team on 01733 511030.